The Maternal and Child Health Bureau (MCHB) Title V Maternal and Child Health Services Block Grants to States Program has established 15 National Performance Measures (NPMs). 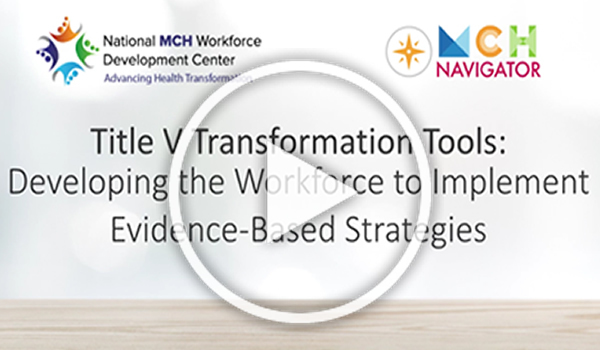 In order to effectively address the NPMs, MCH professionals need to think about not only the evidence and strategies to make change, but also the capacity of the workforce to carry out these activities. Learn more about the resources contained in this portal by watching a 10 minute video. To view, click on the video image on the right-hand side of the page. Access materials by clicking on the topic areas below to find online learning materials, resources, and evidence-based strategies and programs that support the knowledge sets and skills needed to advance each NPM. See other online learning resoures related to health transformation, collected in the Health Transformation Learning Laboratory.